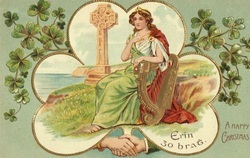 We have an extensive collection of old Irish postcards from Donegal, from other parts of Ireland, St. Patrick's Day cards, and Easter cards. Even one Christmas postcard. Many of the cards have writing on the back and are clearly date stamped so easy to date. Click on any of the underlined links below to view cards in that collection. Those not underlined will be added soon.